What is a Discharge Planner in a Hospital? Working as a discharge planner in a hospital lets you look out for the best interests of your patients. While people check in and out of the hospital every day, not all patients receive a clean bill of health that lets them go home or go back to work. Some patients need an extra level of care that can help them better transition from living in a hospital to living in a different facility. Discharge planners work with both patients and their loved ones when it comes time to leave the hospital. Deciding on any additional treatment needed is one of the biggest tasks of a discharge planner in a hospital. Patients recovering from certain illnesses and injuries may be strong enough to go home but still need help with the recovery process. A planner can make arrangements for the patient to meet with a physical therapist a few times a week, to talk with a nutritionist about dietary changes or around for meetings with a psychologist. Planners use the recommendations of doctors to decide on additional treatments. A discharge planner also needs to talk with the loved ones of a patient to better facilitate this transition. An elderly patient recovering from a stroke needs family members around who can care for him or her, while those recovering from a heart attack needs loved ones to help them stick with their new diet and exercise routines. The loved ones of that patient, especially those who live with the patient, need to understand that they need to increase the level of care that they provide and that they need to make some changes around the home. Many people returning home from an extended stay in the hospital need some extra help around the home. A discharge planner in a hospital will talk with the patient about his or her home life and determine which arrangements to make. 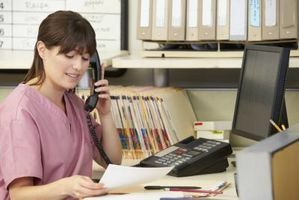 This might include hiring a home health care worker to dispense medications, check vital statistics and report back to the doctors on the patient’s health. Other patients may need workers to come in and assist them with cutting their toenails, bathing themselves and performing other tasks. Depending on the situation, a discharge planner may recommend that the patient have help with doing laundry, making meals and cleaning the home. According to Web MD, discharge planners also order and arrange for equipment when needed. Someone recovering from a stroke may need a walker to get around the house, while someone with a breathing problem will need an oxygen tank. Discharge planners can contact government insurance programs and private insurers to get that equipment covered by the patient’s insurer. They can also help patients find shower chairs, toilet chairs and other equipment that makes using the bathroom and taking care of personal hygiene a little easier. Planners can arrange for other types of equipment and payment for that equipment as well. Many patients checking out of the hospital need some additional medical help, including equipment that they can use at home and medical professionals capable of helping them with their daily needs. A discharge planner in a hospital makes arrangements for the care that patients need at home, work with their loved ones and decide on a treatment plan.